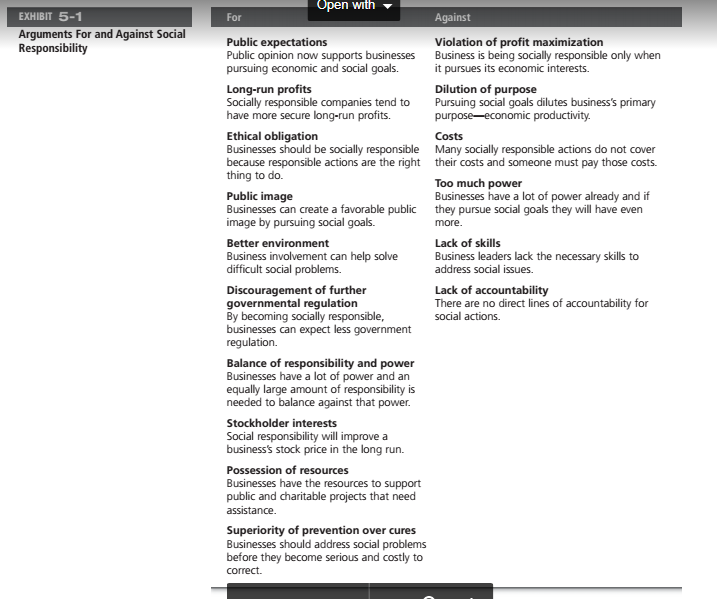 Chapter 5: What is Social Responsibility? Many video and music users from various parts of the world now obtain and the share their favourite recordings just for free using different technologies and file sharing websites. Large global companies and corporations are now lowering their costs by sourcing to different other countries where the rights of human are not given enough priority and they justify their thoughts by saying that they are busy bringing jobs and strengths the local areas. Businesses which are going through a different economy are offering the employees jobs with less hours and fast retirements. Are these organisations socially responsible? Various Managers of different organisations daily are facing to solve such decisions which have dimensions of serving social responses in places such as business employ relation, pricing, philanthropy, product quality, resource conservation, safety and conducting business in those countries which devalues human rights. Now the question is what it means to become socially responsible? Social responsibility can be explained through different ideas and look through different eyes. For instance it is called ‘going beyond profit’ or ‘profit making’ or ‘any discretionary corporative rate activity which intended further social welfare’ & ‘improving social conditions’. We can get to understand it if you can discriminate between social responsiveness and social obligations. Social obligation happens when any firm has to conduct social actions to meet various legal and economic responsibilities. In this case the organisation does only what it is told to do but nothing more than that. This idea tells the classical views of social responsibilities that say the management only social activity is to make profits. The advocate who has mostly out spoken this idea is the famous Noble Laureate and economist Mr. Milton Friedman. Friedman has argued that a manger’s main point of focus is to run this business and get maximum profit with the interests of the stockholders and their main concern is the financial part. Milton has also argued on this topic that when the managers of the organisation spends resources on ‘social goods’ they adds it as the cost of business and hence the prices given to the consumers are risen and absorbed by the stockholders by making smaller dividends. What you have to understand is that Milton never said that the organisations need to be socially active or responsible but the only social responsibility that an organisation should have is to earn greater profit ratio for the stockholders. There are two other concepts which are termed as social responsibility and social responsiveness that reflect the socio Economic view, the view says that a manger’s social responsibility is beyond making maximum profit which includes improving and protecting society’s welfare. Now this concept is basically based on the thought- organisations are not those entities that are only responsible to the profit of its stockholders but also to the huge society outside. As shown in the survey of global executives that corporation in the world are with this view among which 84% of the companies should balance the relationship between shareholders and obligations towards public goods. How these different concepts are differs? The answer is Social responsiveness can be that where a company responds to the social needs of the public in response of some important social needs. Mangers are always guided by socially made values and norms and make market oriented, practical decisions regarding their actions. For example the Ford Motor Company was the1st automaker to bring all federal bans in which messages can be sent while driving. An organisation spokesman person said “The most completely and most new research shows that activities that drives a driver’s eyes sudden away from road for a long period while driving, like texting messages, substantial increases the rate of accidents”. The company owners supported this ban and they felt that this is a crucial social need. In Jan 2010 when the earthquake took place in Haiti, many organisations responded to these immediate needs at that region. Similarly UPS have a policy world-wide that urges its employees to help during natural crisis and disasters. UPS has maintained a 20 person in Logistics Emergency Team in Europe and Asia and the America that is trained into humanitarian relief. An organisation with social responsibilities has different views. It is going beyond the above concept. It not only does what is it socially obliged to do to meet certain needs of the society but also does everything to improve the condition of the society and does the right things which are needed to be done. We can say social responsibilities are business’s intentions, beyond its economic and legal obligations, act in a way that is good for the welfare of the society and do everything to make the society better. This definition assumes a company takes care of its stockholder and obeys the laws but also do such ethical things that will help the society look better but not bad. A socially responsible company does whatever is right according to them because it has its ethical responsibilities within it also. Accordingly the Abt Electronics in Glenview, Illinois, is socially responsible on the basis of the above definition. Being the largest electronic retailer in the US, it gives response to environmental concerns and soaring energy expenses by reducing heating and air conditioning, frequently switching the lights off. A responsible Abt member said that they do all these not only just for money but also because this right thing that they should do to make the society a better place. The concept is just amazing. Now the question is how to vie a company’s social actions? An organisation in US that does not discriminate among the employees above 40 in terms of promotions and retirement an all and that meets the pollution control standards just because it is socially obligated to do so and laws are protected to these acts; these businesses can be called a social responsive one. Whereas when the company is manufacturing recycling papers instead of plastics and giving various child caring facilities for the employees, then it can be called a socially responsible organisation. Here lies the difference between the two concepts. Many environmentalists and working parents have asked for these social actions and social concerns from the organisations. Should organisations be socially involved? The very question is apart from meeting their various social obligations should theses organisations get socially involved? To get a view of this argument there are several for and against arguments regarding the question. Various studies have questioned and examined that whether a company’s social involvement have affects on the overall economic performance of the company. Many of them have found little positive relationships but anyway it is not the generalized conclusion that social involvement is affected to company’s economic performance because there are several other factors that can affect a company’s performance at the same time. The factors included are industry, firm size, economic conditions, regulatory environment and other crucial factors. If a concept shows that the social involvement of a company is positively in relation with its economic performance that does not portrays that its social involvement has caused greater economic performance. What it could possibly mean that larger profit afforded organisations the “luxury” of getting socially involved. These kind of methodological concerns are not to be taken easily. One factual study has told that if the empirical analysis were cleverly corrected the social responsibilities would have direct neutral impact at the organisation’s financial performance. There is another thesis that has explained a company’s participation in the social issues which are not concerned with the company’s stake holders are negatively related with the shareholder value. Another reanalysis concluded that company’s manager can easily afford social responsibilities. Another method of looking towards the concept of economic performance and social involvement is by observing at the SRI funds (socially responsible investments) that provides way for those individual investors so that they can support all the socially responsible organisations. To get the list of SRI Funds you can visit www.socialfunds.com. These funds mainly use a social screening through which they apply environmental and social criteria to important investment decisions. But the SRI Finds will never invest in such companies who manufacture tobacco, weapons, liquor, nuclear power, gambling, fraud products, price fixing and companies that do not manufactures safe products and which do not have good environmental records and employ relations. These fund organisations has grown hugely from 55 to 260 and their total assets have grown to about $2.7 trillion. 115 of the total assets are managed in USA. But what is more important than the amount invested in this fund, Social Investment Forum reports the performance of many of the SRI Funds are comparable to the non-SRI the funds. So the final conclusion about economic performance and social involvement of a company is that a company’s any social actions do not hurt the economic performance at any way. Given social and political pressures that are been socially involved, the mangers need to undertake goals and social issues into consideration when they organize, plan, control and lead.